Search for the best flight prices from Manchester to Atlanta. Compare prices, book today and save money with Manchester Airport. 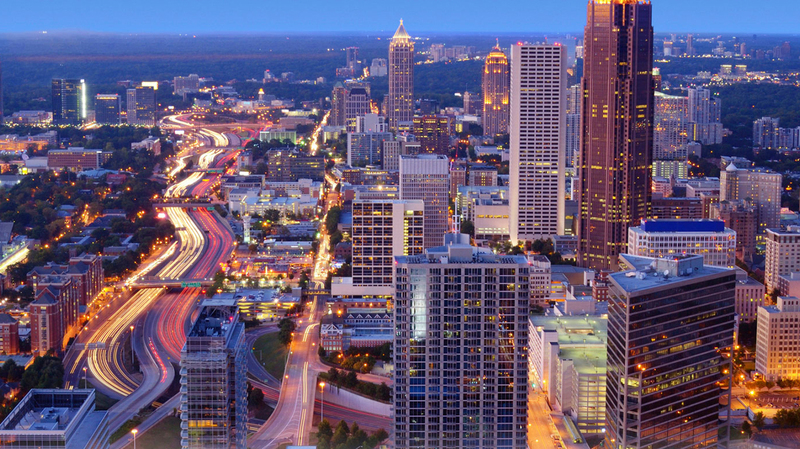 Sprawling across suburban Atlanta is a thoroughly modern city, with a highly contemporary outlook on life. Famed as much for its cultural as its corporate life (Coca-Cola, Delta Air Lines and CNN are based here) it's the high-tech gateway to America's Deep South. From here you can connect to more than 200 USA destinations. So explore! From hip boutique haunts to towering five-star piles, Atlanta has an overwhelming choice of places to stay. For a romantic break in the luxury price bracket, the Four Seasons (75 14th Street) is a fine choice close to superb shops, restaurants and bars. The trendy Ellis Hotel (176 Peachtree Street) is a mid-range gem in a century-old building, with quirky extras such as in-room curling tongs and a women-only floor. If B&Bs are more to your taste and budget, King-Keith House (889 Edgewood Avenue) is in a lovely Victorian mansion along a quiet but central street with a peaceful garden. Atlanta has a wealth of upmarket department stores, immense shopping centres, designer boutiques and intriguing little shops and markets. Lenox Square (3393 Peachtree Road) and Phipps Plaza (3500 Peachtree Road) are two mega malls a short bag-laden stagger from each other in Buckhead. The districts of Little Five Points and Virginia-Highland have edgy and vintage fashion boutiques, such as Bill Hallman (792 North Highland Avenue) and Lucky Exchange (212 Ponce de Leon Avenue). Meanwhile, Saturday's Morningside Farmers' Market (1393 North Highland Avenue) is a happening spot for free cooking demonstrations, food stalls and artisan soaps, candles and jewellery. Atlanta is the home of Coca Cola and hot dogs, so pay homage to fast food with a visit to classic US drive-in Varsity (61 North Avenue), running since 1928. However, there is more on offer in Atlanta than merely burgers and fries. Authentic southern comfort food from fried chicken to gumbo is great value at the landmark Colonnade Restaurant (1879 Cheshire Bridge Road) and the Atlanta Fish Market (265 Pharr Road). For haute cuisine, one of the hottest tables in town is Bacchanalia (1198 Howell Mill Road), where chefs are obsessed with farm-to-table freshness. The legendary leader of the African American Civil Rights Movement is honoured by a US-wide holiday on the third Monday of January, and nowhere more so than in Atlanta, the city of his birth. This catch-all weekend jolly boasts everything from street markets to art and crafts, an antique fair, open houses, music and dance. It takes place in the Victorian-era Inman Park neighbourhood. Jazzmen from all over the world descend on Atlanta in May. One of the USA's biggest free jazz events takes place in Piedmont Park throughout the month, culminating on Memorial Day Weekend. Latin American spirit runs wild in the Centennial Olympic Park for the annual Cinco de Mayo celebrations. Hispanic music stars put on shows, there are folkloric music and dance performances, sports, crafts, and lots and lots of glorious Central and South American food. You may need to punch a few extra holes in your belt after this foodie extravaganza. Expect two days packed with demonstrations by the city's top chefs, wine tastings with savvy sommeliers, and the choicest morsels from Atlanta's best eateries.